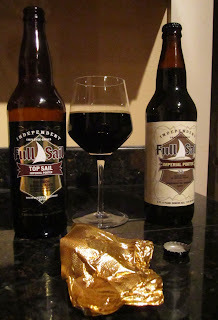 I've stashed my case in the basement, so now I'm going to share with you one of the best beer bargains in Oregon at this time of year: Full Sail's Imperial Porter (on the right in the photo -- I'll talk about the beer on the left in a minute). It's under $5 a bomber ($4.25 at Beermongers), and a nice hearty beer to drink right now, but cellar it for a year or so, and you'll have a great beer for any occasion. It's on the shelves now -- I highly recommend it. Fresh, there's an angular bitterness to it; it's pretty dry, with very roasty malts and 60 IBUs of hops. After mellowing out for a year, it gets a little smoother, the flavors meld together, and the chocolate/coffee flavors of the double porter come to the fore. $4.25 + 365 days = delicious. The beer in the glass in the photo is actually not the 2011 Imperial Porter I'm praising in this post. It's the 2010 Top Sail, which is the 2009 Imperial Porter, aged in bourbon barrels for a year before bottling. Tonight I cracked open a bottle I had in the basement, and it's a boozy, vanilla-y thing of beauty. I recall it being ready to drink as soon as it was bottled last year, and I can't say that I think its time in my cellar added anything, though it hasn't suffered either. Here's the thing: when you buy the foil-topped barrel-aged bottle, it's more than twice the price of the fresh porter -- usually at least $11. It is a fair amount stronger in alcohol at 9.9% ABV vs. 7.5% -- is that due to evaporation/fermentation in the barrel? added bourbon? -- and definitely gains some interest from the bourbon flavors. Also recommended, but not twice as recommended as the un-barreled one, especially if you give the cheap one a year to age. As you may know, Full Sail alternates years between releases of the Brewer's Reserve Imperial Porter and the Imperial Stout. This allows them to barrel-age part of the batch for a year, so in even-numbered years a barrel-aged porter and fresh stout are bottled; in odd-numbered years a barrel-aged stout and fresh porter are bottled. When I was buying my case at Beermongers, Josh pointed out to me that's another good reason to stock up on this year's porter -- so you can compare it to the barrel-aged version next year. The barrel-aged ones get special names: Top Sail (porter) and Black Gold (stout), though apparently in 2007 (and before?) the unaged porter may have also been called Top Sail, judging from this old Beer Advocate page. For some reason, Full Sail's Imperial Stout -- aged or no -- doesn't grab me like the porter does. Oh, it's good, but the porter always seems rounder and more chocolatey to me. Look for it now, and stock up. I've picked a few of the imperial porters up and drank them already this year. It is a great deal for under $5, but I think they're a bit underwhelming in body and complexity, and haven't considered trying to age some. I do like the barrel aged versions. I have a couple of top sails and black golds in my garage right now, but have been discouraged about the price points lately. Fred Meyer has a bunch of Black gold right now for $12.99. I realize in the whole scheme of things, $13 for a 100% barrel aged beer is actually a good deal, but here in Portland, I'd rather spend that stocking up on abyss. I think the full sail offerings are tasty, but maybe a bit too light on the body for my taste, and the barrel seems to dominate the flavor profile compared to a lot of other barrel aged porters/stouts that still show a lot of character from the base beer. My favorite deal from Full Sail is the Old Boardhead. I had always seen them as a good "bang for the buck" beer, but after trying two vintages from the late 90's at Fred Fest last year, I'm a real believer. I bought up a bunch of last year's, and a bunch of this year's too. In fact, I need to do some grocery shopping today, I'll have to sneak a couple more into the basket! You're right, the non-aged one is not very complex. But a few months ago I pulled a 2009 out of the basement, and it had turned into a very nice, smooth, balanced beer. I wouldn't age it much beyond a year, but at $4.25 a bottle, it's a great investment, and you never feel like the occasion isn't special enough to open one up. It was love at first sip last year when I found the Top Sail on tap and I stashed away a few bottles. I agree that the porter tends to have quite a bit more coffee/chocolate than the stout which is my preference. What I liked about the Top Sail was that the bourbon didn't dominate in the way it does in the Black Gold. I'd love to get my hands on some of the Imperial Porter. For some reason, though, over here in Missoula there have been no Full Sail bombers on the shelves in months. I don't know if that's a choice by Full Sail, a problem with the distributors or what. I was fortunate to try the Black Gold on tap, but there's been nothing in the stores to grab and put away. Thanks for profiling this Bill. I like the price and will give it a try.